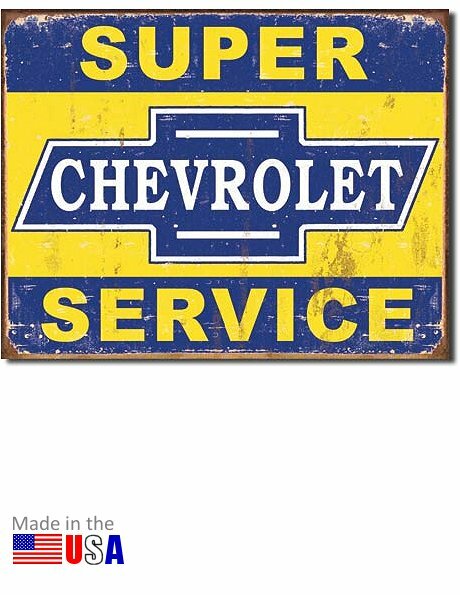 Chevy fans and lovers will enjoy this licensed replica of the classic Chevy Super Service sign, as seen at dealers and repair stations decades ago. Reproduction tin sign make great, affordable decoration pieces for the garage, office or den. Plus they also are great gifts for the hard-to-shop-for gearheads! This is a metal sign, made in the U.S.A. Measures 16 inches wide by 12.5 inches high. UPC: 6-05279-11355-2 | Part No. 1355. Ask a question about "Chevrolet Super Service" Tin Sign.